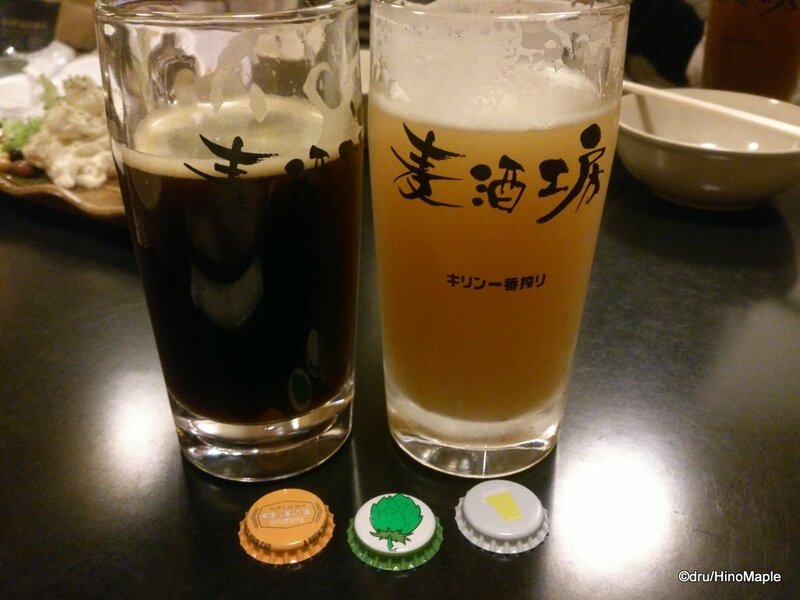 The Asagaya Beer Kobo, translated into the Asagaya Beer Workshop, is a very interesting place. 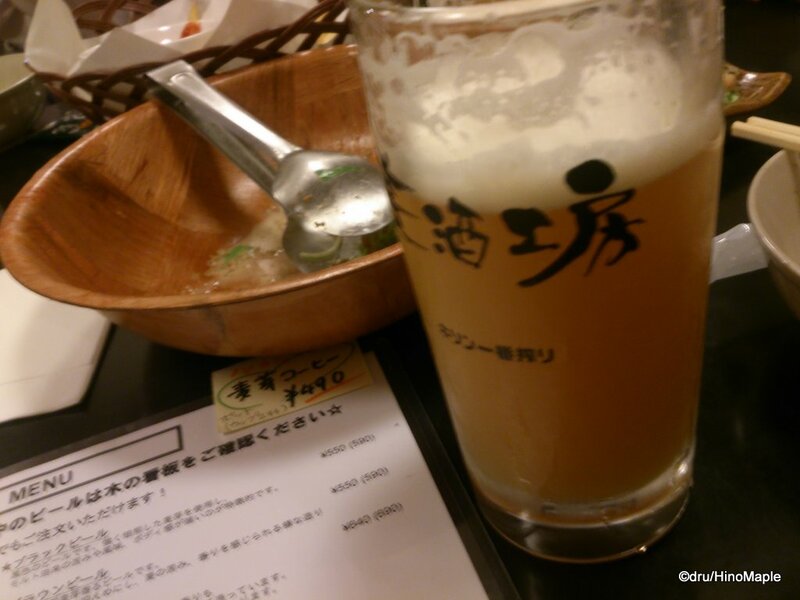 It is part of a chain of “Beer Workshops” with the original being in Koenji. 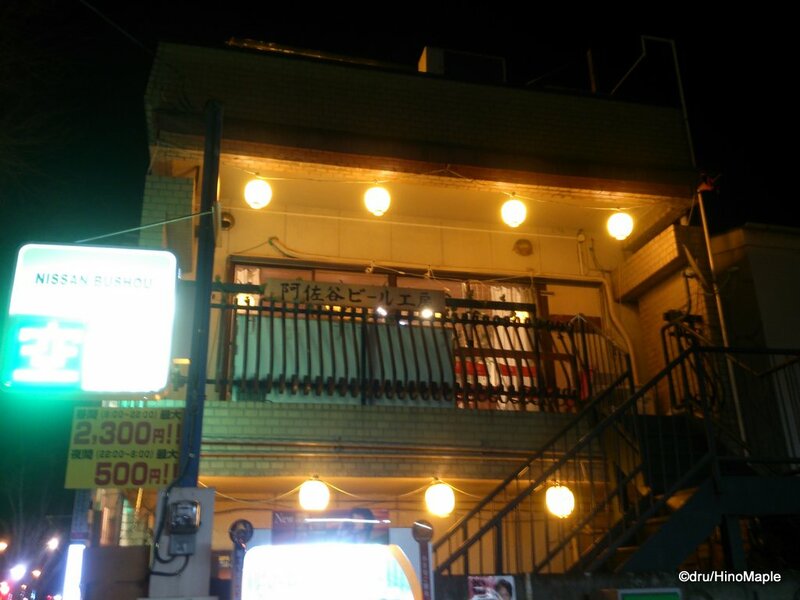 The Asagaya location is their second location with an Ogikubo and Nakano location also open. I’m not sure if all of the shops have the same beer or same theme but I hope to check them all out in the near future. The idea of the Beer Kobo is very smart and simple and they play the idea very well. I was very excited to go to the Asagaya Beer Kobo and my expectations were very high. Unfortunately, for this beer snob, they failed to live up to my expectations but they still produced a very good product and I wouldn’t hesitate to go back again. 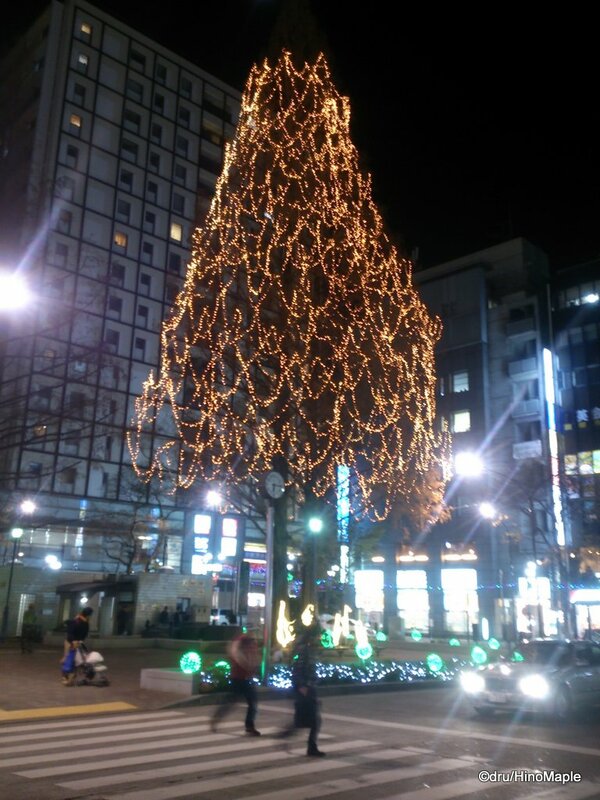 It is pretty easy to find the shop as you just head north along the main street from Asagaya. It stands out at night as it is one of the few very bright shops in the area. It is 3 levels with an interesting system. When I visited, the first floor seemed to be mostly people drinking and the second floor had a lot of people eating and drinking. There is even a third floor that is actually on the roof of the building, but since I went in winter it was pretty empty. All of the servers seemed pretty chill and relaxed, almost like hippies, so you feel at home very quickly. On the second floor, they have 2 sections. There is the main open section and a smaller private area. During the winter they have kotatsu in the private area but in the other seasons they bring the kotatsu outside. It is a great idea and I can’t wait to go there in spring or fall and enjoy the kotatsu outside. The kotatsu inside was great as I was freezing after coming inside but I really couldn’t enjoy it too long as I just got too hot. My friend reserved most of the area and while at the beginning we had other people there, it was soon all ours! Being a Beer Workshop, the beer takes centre stage. They had about 6 beers on tap in any given season and the second you walk inside the shop you can see their fermenters. I believe they have 3 regular beers and a rotation of other beers. Of their regular beers, I know that their Blonde and Pale Ale are there. I’m not too sure on the third regular beer as it might change depending on the season as they said the Hot Ale was a regular beer on their website. When I went, they also had a Winter Porter, Silk White, and Strong Ale. All of the beers tasted good and I had no problems drinking it. The beers were also cheap and priced competitively to Kirin, which is surprisingly also on tap. We had the all you can drink course so we didn’t have to pay for any beers for 2 hours. I believe everyone in the shop gets lanyards with a tag which basically told them we had the all you can drink course. We had to go down to the first floor to get our own beers but the food came to us. If we didn’t get the course, we would get our lanyard stamped and then pay at the end. The only reason I was disappointed with Asagaya Beer Kobo is because they came off as being an amateur style shop. The beer was pretty cloudy, although some people aim for this depending on the yeast they use and the style they make. I even had some malt in my Winter Porter; this is not a good thing. I also had a small problem with the names. Their Blonde was a nice caramel colour and their Pale Ale was a nice golden colour. The Blonde had nice notes of caramel and the Pale had a crisp hop note. I felt that switching the names would have been a lot more productive for people who really like beer, or snobs like me. I am a very tough person to please these days when it comes to beer but my friends all loved the beer. I still like the beer but I think that they can improve a bit. The food was a different story. They had a lot of great dishes and I was very happy with what I had. We ordered a 3500JPY set that included a food set and all you can drink for 2 hours. It wasn’t even one of the all you can drink sets where you actually have to order your last drink 30 minutes before the end and get out after 2 hours. You can just enjoy that last beer for as long as you want. The food started off simple with salads before the main course, bacon, came. Yes, I love bacon and the thick slabs of bacon that came were the best thing I could have. I would come back just for the bacon. The quality of the food was pretty good too and I felt that I definitely got my money’s worth. Asagaya Beer Kobo is a great place to go to and I highly recommend you to go there. While I had some problems with the beer, I still think it is a good beer. I think they are doing a great job and it is very affordable. Prices are actually very cheap, especially since you are getting craft beer. Do go there and enjoy the laid back atmosphere. You won’t regret it. Note: The Asagaya Beer Kobo has moved since I first visited. This report may no longer be valid regarding the beers and food. 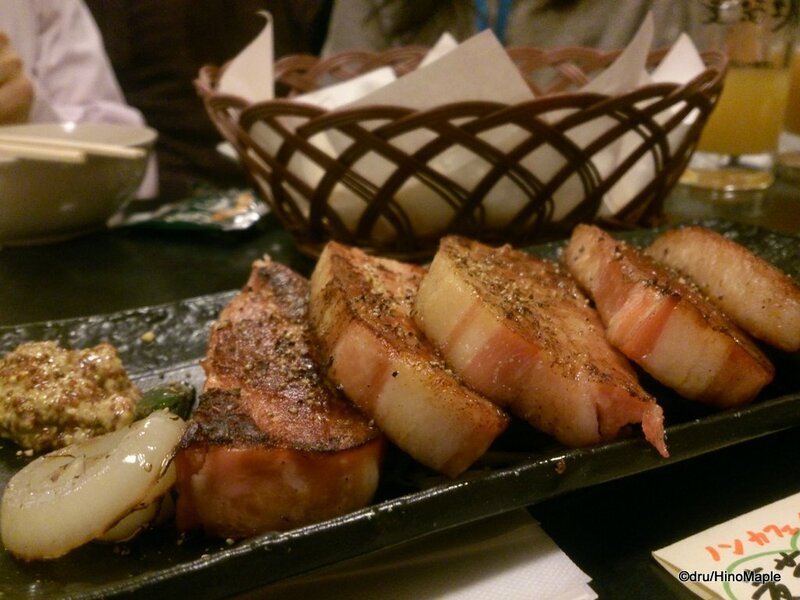 This entry was posted in Tokyo Food and tagged Asagaya, Asagaya Beer, Asagaya Beer Kobo, Asagaya Beer Workshop, bacon, beer, craft beer, japan, tokyo by Dru. Bookmark the permalink.